All of the pictures in the montage above were taken from the stage of Listen & Be Heard Poetry Café of performing artists who have appeared there to share their poetry, stories, comedy and music with those who would hear them. All of the artists above, and more, will be returning at some time during the day of our First Annual Listen & Be Heard Marin Street Summer Arts Festival, when inside the café, we will offer the community in one day what we offer throughout the week. The day will start off with a jam session from 11am-2pm. Our hosts from each Saturday of the week, Tom Hamilton, Ed Rivers, Dave Tilton and Dennis Ocampo will all come to jam with each other. Musicians are welcome to bring their instruments and join in. Starting at 2:30pm and going until 4pm will be a storytelling circle which I will host. Meant for people of all ages, this is a time to listen to and tell stories in a relaxed and intimate atmosphere. Whether true or tall, all stories and storytellers are welcome to join in. At 5pm we will feature poets Q.R. Hand Jr., Irman Arcibal, Eileen Hidalgo, Jessica Ryan and Bill Vartnaw. 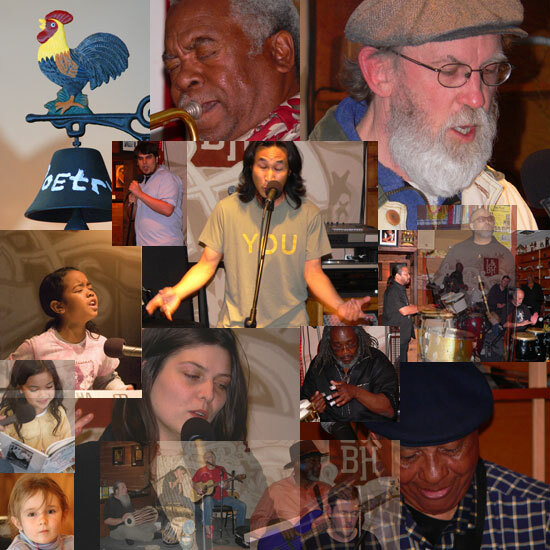 They have all appeared here numerous times before and are part of the Listen & Be Heard Poetry Family. Gabi Wilson, Vallejo’s budding super songstress will make an appearance at 7pm. If you don’t want to miss her then get here early! At around 8pm, if you’re not loosened up entirely by then, you’ll have to let everything go and just laugh, because it will be time to get a little goofy, talk some sh*t and let it go with our comedians Ellery Urquhart and James Fluty. After that make you sure you have your dancing shoes, and intentions to enjoy the beat of the drum, because The Talons will bring the beat of Africa to Marin Street for the after-party meant for everyone who took part in the day to come and enjoy. The entire day of entertainment will be entirely free. But that’s just what’s going on inside the cafe. Directly across the street, the Vallejo Music Theatre will be hosting an open house so that you can see first hand their plans for a performing arts venue with two theatres and much more. You will be able to enter the Vallejo Artists’ Guild and be sure to pay a visit to Goodie’s studio when you do and tell him I sent you. Adolfo, Bill Bloom and Robert Gepford will have their studios open, and the Vallejo Naval and Historic Museum will be hosting a free family day, including an author signing and reading at 11am. Participation and interest in being part of this first annual event has been growing from week to week. Arts Vendors and groups from other areas of the city will be set up with tables to sell their work or share information with you about their activities. Tonight is the deadline for those who wish to put out a table to get their applications in to us. It is a free opportunity. As of press time we have commitments from the following: Usarian Arts Publishing, Vallejo Ariels Bicycle Club, Abubot House of Imported Filipino Handicrafts, Sufi Order of Vallejo, Cinnabar Paintings, Sheila Ryan Photography, Raven’s Fire, Rose Nouveau, The Honey Mill Marin Street Artisans, Zebra Ink, V.N. Collectibles, Guna Verbere Paintings, KethSmartArt, Carve to Carve Creations, Jim Cosgrove Photography, Michael Meese Photography, Hogan Drumline, Vallejo Yoga Teachers, Moschetti Coffee and Peace and Poetry Greeting Cards. Material Visions, the boutique on the corner of Marin and Florida Street has also arranged it’s own group of vendors, the Vallejo Artists’ Guild will have its members represented, and Adolfo, Bill Bloom and Robert Gepford who all have studios on Marin Street have also arranged for vendors to be set up in front of their studios. The big picture is what it all means when all is said and done. What it all means is that when people decide to get together to make things happen, things do happen, and they lead to more and better things down the road. Please join us on Saturday, bring your friends, spread the word, and give us your feedback!